Telling: San Antonio For many civilians, the realities of war are just images on the local news from far-off lands in upheaval. In Telling: San Antonio, a three-act play organized by playwright Jonathan Wei, veterans and their families are given a voice to share their experiences. 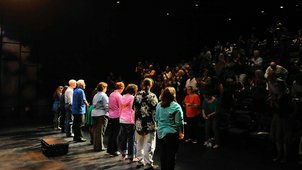 A dozen local vets from all walks of life practiced their monologues for weeks and presented their stories during a live performance at the Tobin Center for the Performing Arts in San Antonio, Texas. Telling: San Antonio was presented by KLRN. Watch the full program below, and learn more about the project by visiting the KLRN Veterans site.